Winchester is, in a way, a veritable Jerusalem – but with fewer stinking people who are convinced they are Jesus. 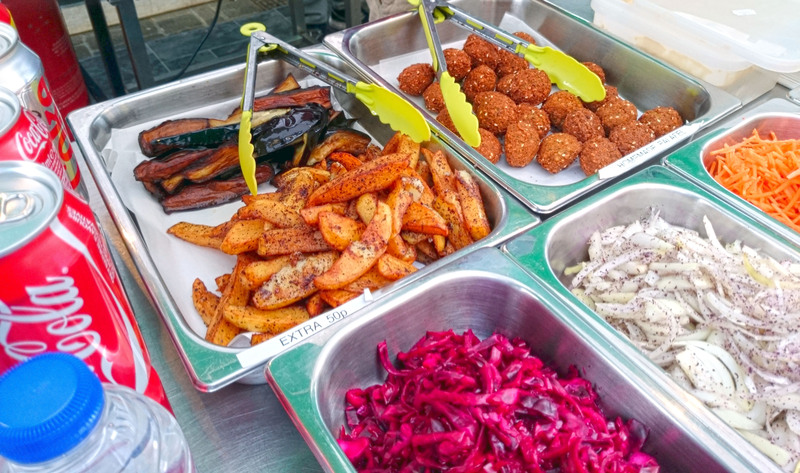 A trip to the Falafel Express stand, on the High Street every Wednesday and Thursday, will only convince you further that you are in Al-Quds. 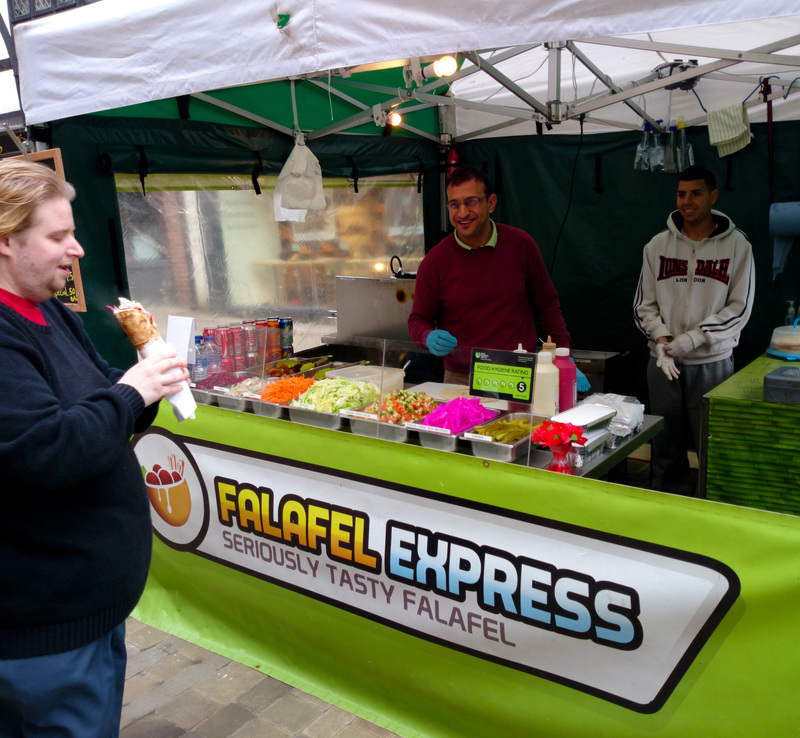 Falafel Express are also on Southampton High Street on Fridays, Saturdays and Sundays; a place also with a similarity to Jerusalem in that you stand a high chance of getting stabbed if you walk about the seedier areas. 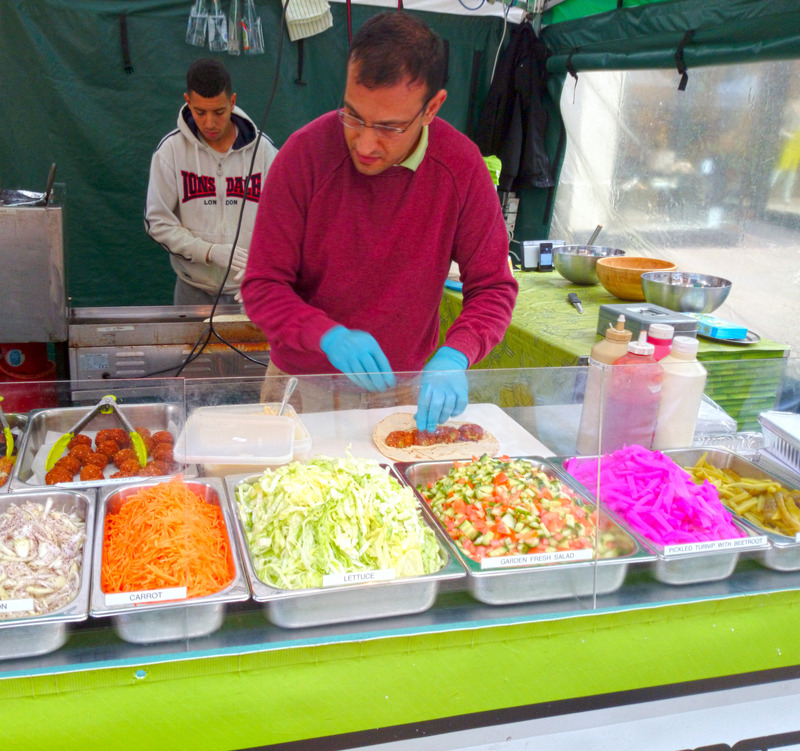 Let us cut straight to the chase: Falafel Express make the best falafel wraps I have ever had. They are totally delicious and are the fast food you want to get in these two cities on the appropriate days. Before we move onto the gorgeous picture gallery of them being made (RSS and email subscribers will have to come to Elitistreview to see the gallery) I will tell you why. As ever, it is ingredients that are the key. 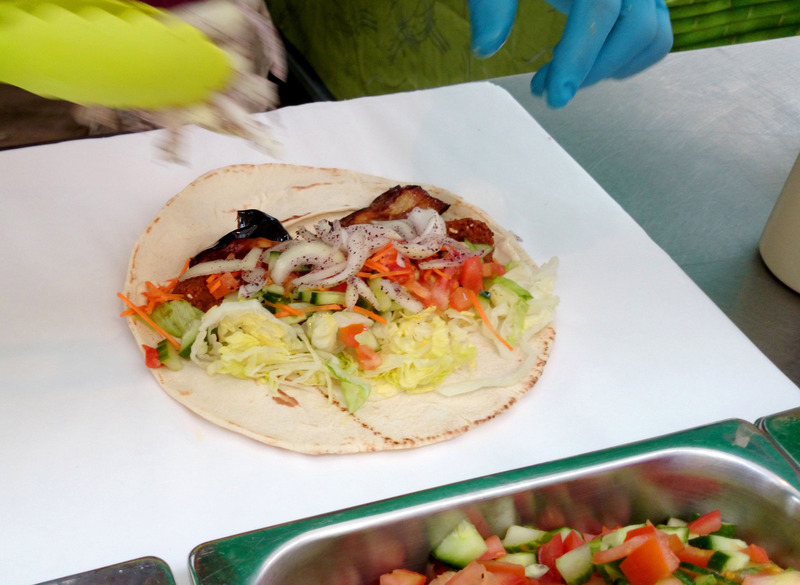 Everything that goes into one of Falafel Express‘ wraps is perfect. The onions are freshly chopped and sagely spiced. The fried aubergines are meltingly tender and delicious. They use high-quality hommos and tahini are top notch and applied liberally. There is a thrilling, piquant chilli sauce that enlivens but does not burn. All the other vegetables have been prepared with care and are as fresh as a daisy. The falafel themselves are brilliant. Squashed into the hommos, the outer crust, which is fried to perfection in oil of the correct quality, is still coherent enough to provide a satisfying bite. Inside the falafel the ground chickpeas are wonderfully spiced and have the correct grainy/squishy ratio. 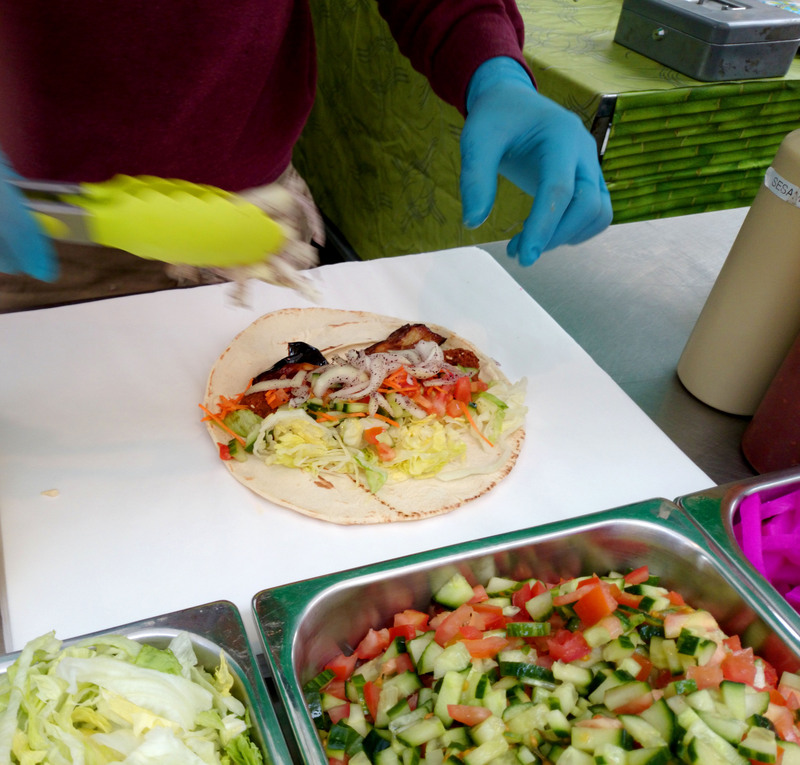 All of this is contained in delicious flatbread and served wrapped up so your shirt and trousers are safe from drips. 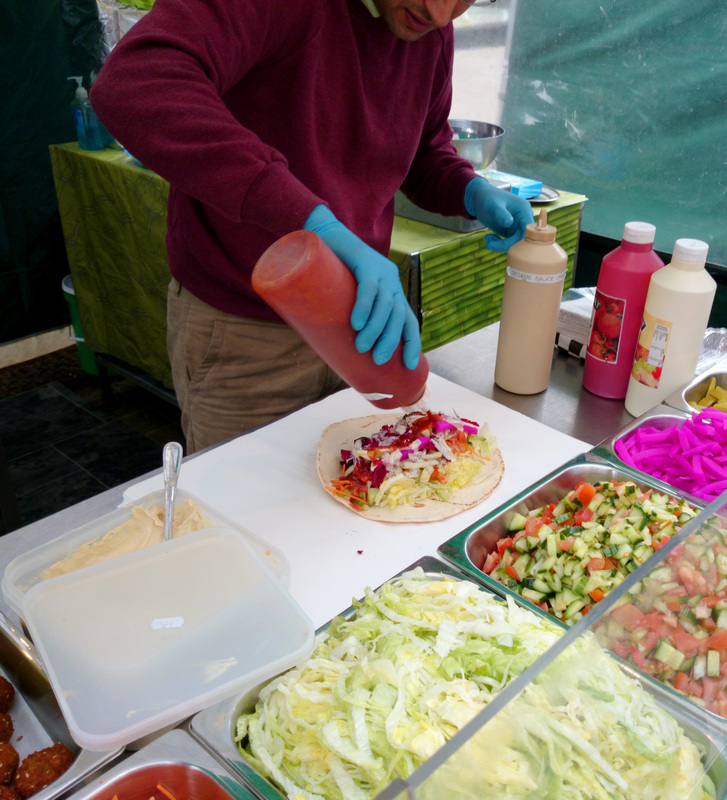 Falafel Express really make fast food of effulgent intensity – the combination of flavours and textures is utterly compelling and a wrap will keep you going until it is time to hit the pub after work. As we know, quality exists at all levels – good fast food is really good. So there is absolutely nothing wrong with enjoying the pinnacle of Near-East morsels. 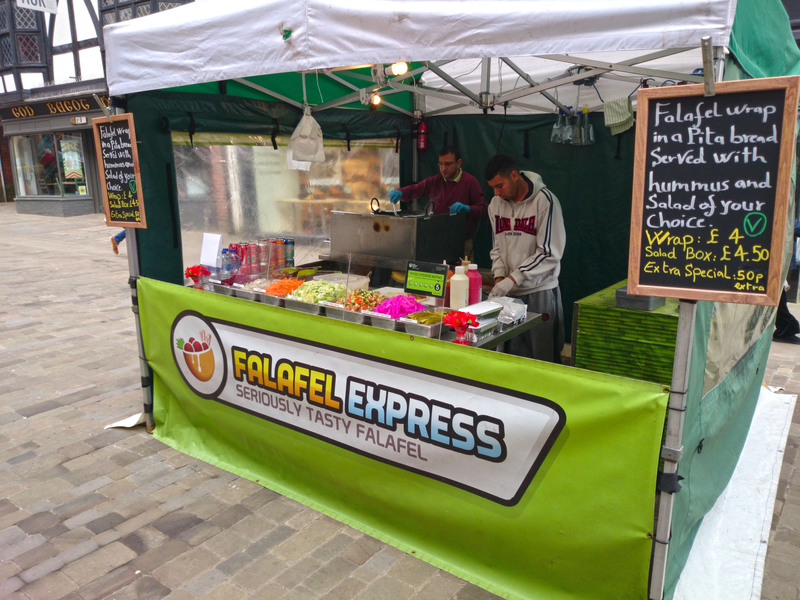 I highly recommend them and whether you live or work in Winchester, England’s Al-Quds, or the grottier Jerusalem of Southampton you should be beating a path to Falafel Express! As a child, I refused to believe that Falafel weren’t made with meat, because they were simply too delicious to be vegetables. 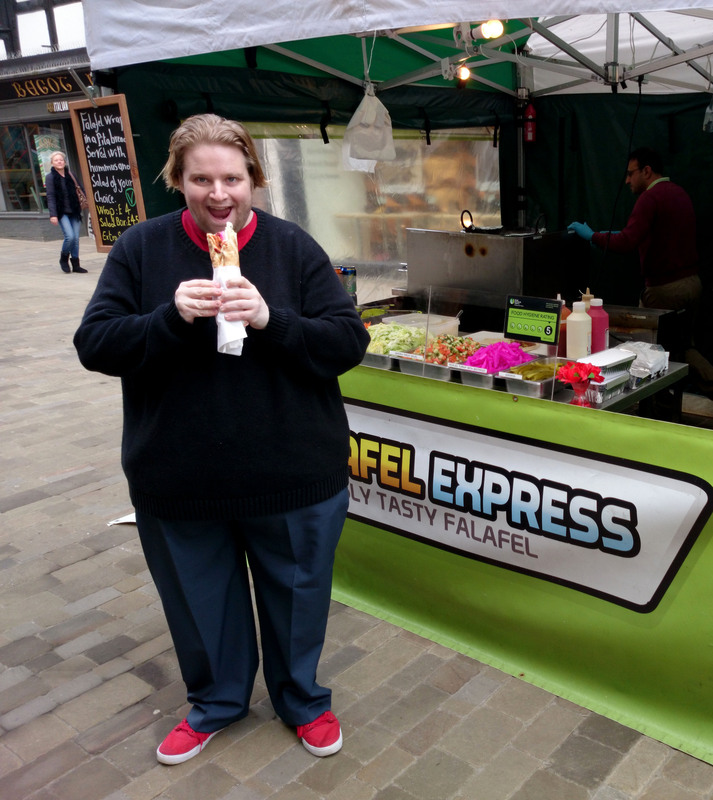 Falafel Express’s falafel are about eighty times tastier than the ones from my childhood, and make Winchester an even more brilliant place to live. The only thing I can think of that would make it even more the perfect English city is if a Banh Mi stall were to open on the High Street. 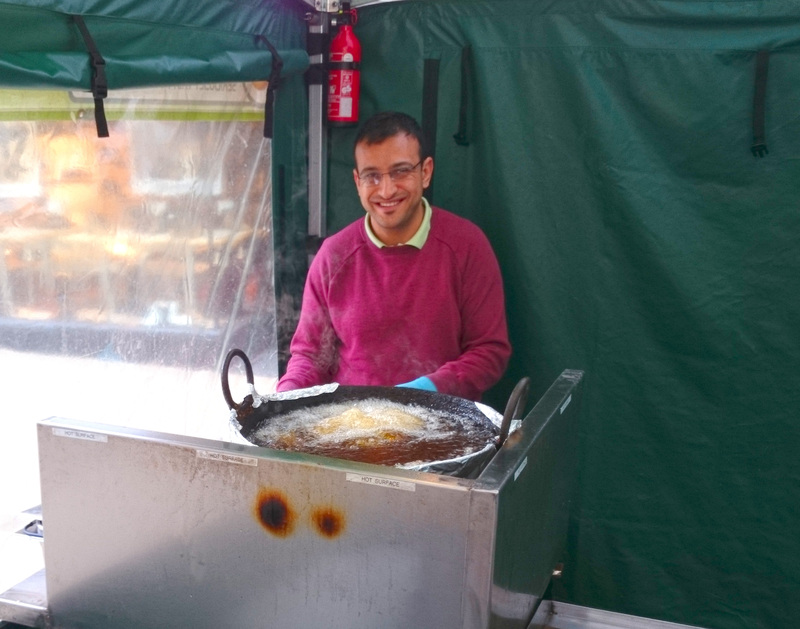 Now, a banh-mi stall, that would be magic! 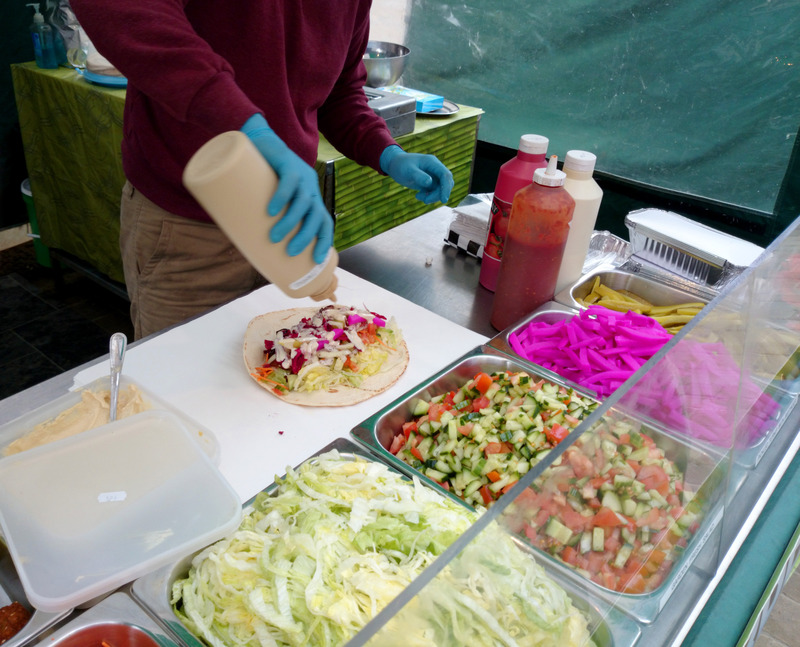 Now I know you like falafel I’d be delighted to take you to my favourite falafal stand over here in Jerusalem if you are ever in the area! I like to add very thinly sliced pickled cucumbers. 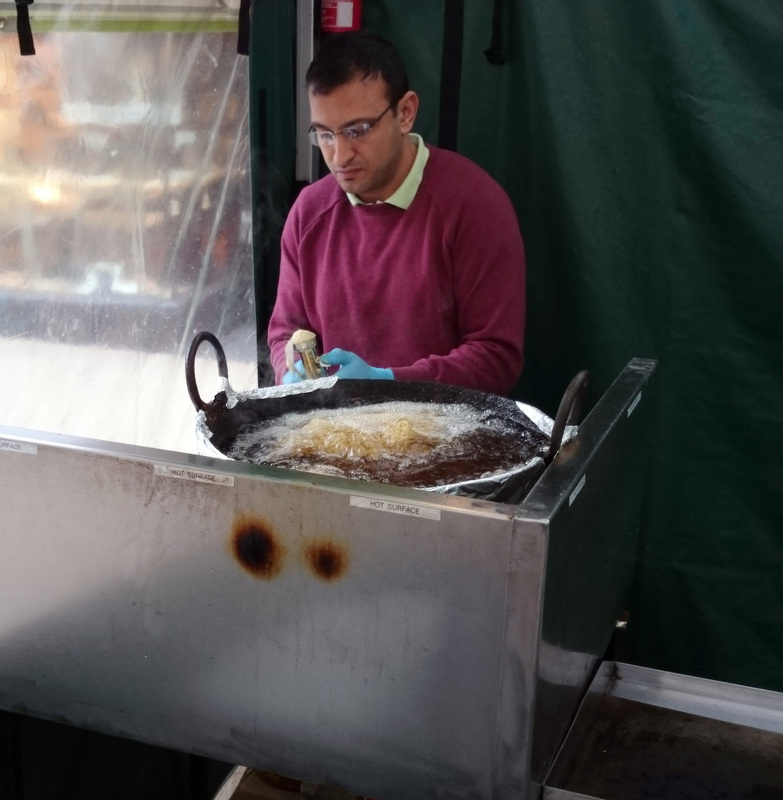 The texture and acidity work very well against the flavour and feel of the falafal balls. Looking forward to seeing you and may even be able to (pleasantly) surprise you with some of the local wine!